Have you ever gone to the Eye Dr. and tried on glasses only to realize you had not been seeing clearly and had not even realized it until that very moment? I have!! It was such a surprise to realize my perspective and experience of life had not been as clear as it could have been, or as it needed to have been. This is the gift God has continued to give our family since 2010. We first experienced this with Kristi's cancer diagnosis, then my son Taylor came close to death with a septic hip and staph infection, followed by learning Kristi's treatment for a cure would be permanently life altering, and this past week my brother in law Jeff survived the "widow maker" and following surgery found out the scary and disappointing news that he has quite serious heart disease. (This is Amy's husband) We have also changed our perspective as we have watched or walked through suffering with many of you. We are celebrating life......the ability to fully live the life God has given us! We are celebrating relationships......the ability to share life with those God has given us! We are celebrating worship.......the ability to love and serve and worship our Savior! More than anything, we are asking God to give us HIS perspective about all of life.....our time, our relationships, our work, our spiritual, physical, financial, mental and emotional resources, etc...... so that our experience of life and relationships and worship will be what He wants for us and for HIS glory. Today we are all celebrating that Kristi is home with her children and that God has provided a way for her to continue to be a Mom to Isaiah and Alyssa. Kristi had set a goal to be able to go to Isaiah's choir concert last week and she made it. Today she set a goal to attend church for Mother's Day and she was able to attend. It took a lot out of her and felt like a long time to sit, but she lived life today with her children, her Mom and her family. This made her happy!! When I was there two weeks ago, it was heartwarming for me to see the kids be able to ask Kristi permission to do things, or show Kristi their homework, etc instead of me. One night, while I was caretaking at the Wright house, Kristi was having a good night and was laughing and interacting with her children, and it felt so good to the kids that Isaiah didn't even want to break away to take his shower. 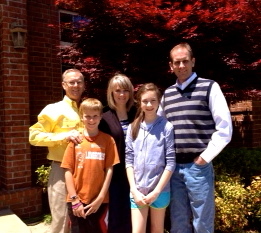 On this Mother's Day, our Mom is now in Arkansas mothering and grand mothering the Wright Family. Our parents flew into Arkansas late Monday night and were greatly needed!! Due to Jeff's sudden heart tests and hospital stay and Katy having both boys sick, they were both needed. Dad stayed at Amy's house with Breck and Kacey and Mom has been at Kristi's house. Josh and the Soderquist family joined Amy at the hospital. We have said this before, but we are so grateful for a BIG family! We are even more grateful to know the Lord and His strength and hope and grace for times such as these! Mom.....the caretaker for the Wright Family this week. Thank you Lord for allowing Kristi to celebrate Mother's Day 2013! Dad...the caretaker for the Soderquist Family this week! Thank you Lord for letting Jeff be here to celebrate Mother's Day! Kristi is going off of 2 of her 3 antibiotics today. She has been anxiously awaiting this on two accounts. She is hoping it will help with the evening nausea (this past week she has thrown up several evenings). But she is also fighting anxiety about returning infection without the medication. She was so sick and miserable her 24 days in the hospital and it has taken 6 weeks to gain new strength back. Please pray that God will take her thoughts captive and that her fear of another setback due to infection will not control her mind. Kristi is battling dehydration and possible anemia. Pray that she can be rehydrated and rebuild her iron without needing IV treatment. Please pray that Kristi can find the right ostomy bags for her body. It has been a frustrating process recently. They tell you this will be part of the process so it isn't unexpected, but there is so much to making this adjustment mentally and emotionally and physically. Overall, God's grace has covered Kristi with this life altering adjustment above and beyond what we would have expected. She has some hard days and grieves different losses or gets frustrated with the process, but over all......She looks at life through the perspective of just that........the opportunity to have life. I don't know what your circumstances are as you read this, but I pray that you are allowing God to use your circumstances to change your perspective.....allowing Him to give you Spiritual Eyes in order to see clearly through new lenses that change how you see life, God, yourself and others. We continue to learn this truth.......Our perspective does change how we experience life and relationships and sometimes we are more blind than we think! Let's not allow being too busy, fear, unforgiveness or pride to blind us from what God wants us to give or receive....for we know not what tomorrow brings! (James 4:13-16). We plan to continue to give you an update every 7-10 days. Thank you for the many that continue to pray and follow Kristi's story.......God's story! You have now walked with us for 3 months following Kristi's surgery. Kristi says, "Three months down......nine more to go!!" I flew in on Sunday to give my siblings a break from caretaking for the week. I knew Kristi would visibly show improvement, but she shocked me when she got up off the couch by herself and just took off walking to the kitchen without her walker. I was so excited to see her walk and not shuffle and be hunched over!! the Wrights, and Kristi has been eating really well this week! 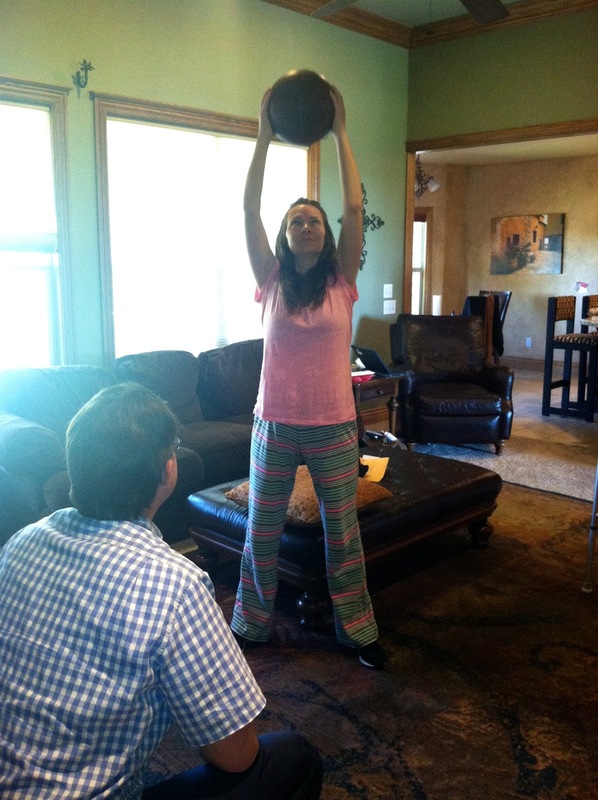 Kristi had a major new workout this week with her Physical Therapist. Her kids were so excited when she told them that she had "played basketball" that day. Chris had her put a basketball on the floor while sitting down and then stand up and hold it over her head. Then they walked outside and shot a few baskets to use new muscles. She has appreciated Chris' creativity in helping her with objects around the house..... and this was one that brought the children into it and made them happy! Monday was an emotional day for Kristi full of ups and downs. She went from getting the news that a woman she met through her cancer posse at church had lost her battle with breast cancer, to receiving news that a long time friend of our family wanted to help them monthly with the exact amount of their house payment. She had no knowledge of the amount of their house payment either!! God is so awesome in how He goes before us. This removes some of the stress if their house does not sell immediately. Please join us in praying for the family of Martina Peacock and in praising God yet again for HIS provision through His people. We are also feeling the weight of our other friends struggling with cancer and difficult news. We would love to ask you to also pray for encouragement and strength for Toni Simmons from our home town of Meeker, CO and our new little friend Julia Cobb we met at MDA. They are both on facebook under Toni's Story and Jucan and both started with Ewing's Sarcoma. We are afflicted in every way, but not crushed; perplexed, but not driven to despair;9 persecuted, but not forsaken; struck down, but not destroyed; 10 always carrying in the body the death of Jesus, so that the life of Jesus may also be manifested in our bodies. 11 For we who live are always being given over to death for Jesus' sake, so that the life of Jesus also may be manifested in our mortal flesh. 12 So death is at work in us, but life in you. Martina and many others in this cancer group desire more than anything for God to be glorified and Jesus to be known....whether in life or in death. May we all live with this perspective with whatever suffering God allows in our own stories.